Peter Wiles showed no hesitation in showing his dominance in the RA class at the first 2017 PRACC series event and Met. 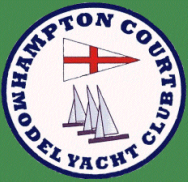 & Southern District Championship held at Hampton Court on the 19 March. With 16 entries, many coming from some distance, the day was going to be a good test of boats and their gear. Following the Race Officer’s briefing at 9.45 and a pep talk from Bob Connor the RA class captain, racing got under way promptly in two fleets. All boats decided to sail with second rigs with the exception of two who had full height reduced roach mainsails. Peter Wiles managed one way or another to win all races through a combination of excellent boat handling and strong wind tactics. He was challenged several times but always managed to claw himself back to the front. 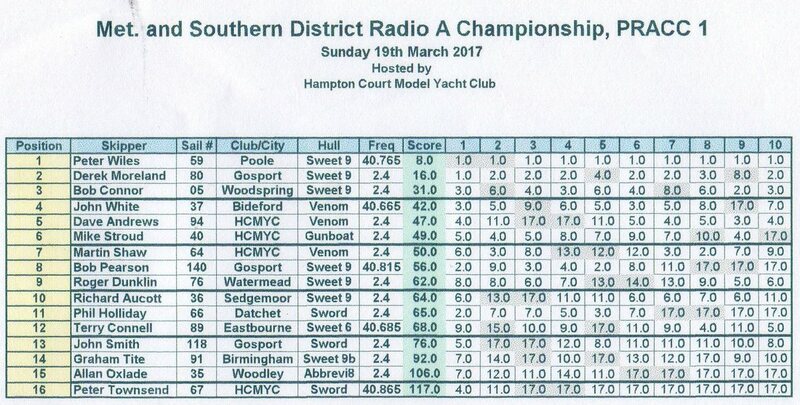 Derek Moreland (Gosport) turned in some consistent results achieving six second places giving him a solid second place overall on 16 points followed by Bob Connor with 31 points. Several boats had, by lunchtime retired due to gear failure of one sort or another allowing the Race Officer to combine the fleet into one for the remainder of the racing until last race at 4pm. Many thanks to the competitors and race team for supporting this event, there was absolutely nothing not to like about the whole day.